Alborough House and our character holiday cottages sit in the rural hamlet of Forncett St Mary just 9 miles south of Norwich and close to the Suffolk/Norfolk borders. Nearby attractions include Banham Zoo, Steam museums at Bressingham and Forncett and Wymondham Abbey. The village of Long Stratton is 3 miles away with shops and facilities and the market Town of Diss is nearby. 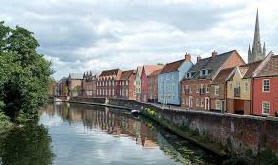 The medieval city of Norwich is some 9 miles north. Dunston Hall some 5 miles away has a wonderful Spa and Golf course (open to non-residents) . 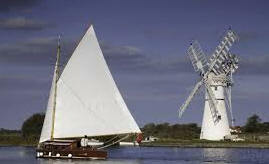 The famous Norfolk Broads are within easy reach and perfect for a day exploring on one of the many boats for hire. 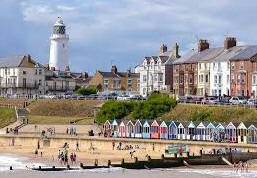 The Suffolk Heritage coast is under an hour away and includes the famous towns of Southwold and Aldeburgh, popular for their coloured beach houses, fashionable shops and beaches, including some of the best fish and chips around. Also within reach is the North Norfolk coast, including seaside towns such as Cromer and the pretty town of Wells next the sea, famous for crabbing along the quay, Blakeney and of course the beach and stately home at Holkham. Slightly further away is the Queens Christmas residence of Sandringham, but still easily accessible for a day trip. Both our barns are equipped to high standards and offer the appealing combination of character features together with modern day central heating, kitchens and bathrooms. Both barns are equipped with hobs, fan ovens, microwaves, washing machines, irons/iron boards, TV/DVD, hairdryers and more. We are flexible with our accommodation and can offer sofa beds for young children in addition to the standard beds/bedrooms in our barns (please advise requirements prior to booking). We welcome well behaved dogs (see our terms and conditions for details) and each barn has its own self contained small garden. There is ample car parking available for our guests. It couldn't be easier to book with us. Check the availability for the barn you wish to book then get in touch with us via the contact us page on our website or by email. 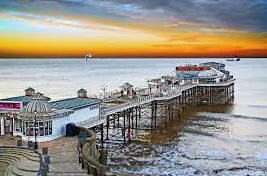 We'll confirm back to you and send you a booking form ready to secure your fantastic break with us. Alternatively, just give us a call and we'll sort it all out for you. 2017 was our first year at Alborough house and we're looking forward to welcoming back some of our lovely guests in 2018. We're so pleased we've maintained our 100% 5* feedback and met the high expectations of our guests. We're always open to new ideas and suggestions so just let us know if there's anything you need or think would be a good addition to our barns.